Can people who have used SmartThings please answer if ST offers the security features I listed below. Note that IRIS did all these things, and that’s why I liked it very much (still can’t believe I have to start talking about IRIS in the past……..). And I want these features out of the box, not after hours of tinkering and customization. 5. If at any time the sensor disconnects or goes offline, the system will notify me. Also, how soon will I get the notification? 11. What kind of notifications provided when the alarm is triggered: mobile app notification, SMS, phone call, email, or multiple? 15. Will IRIS sensors that work with SmartThings be supported on all the above features and can participate in the security setup with no special limitations? 16. Does the SmartThings hub have low power consumption (under 5W)? - this is critical for proper battery backup. 1. Keypad (wireless) to arm/disarm with a PIN - You would have to use someone else's "Code" or "app" to make this work. 4. Ability to exclude a sensor from all arming modes (Full, Partial, etc), however get notified every time the sensor is opened/triggered - Not sure this was an option in the app. 8. Records the history of all sensor events, with a timestamp - it did do this. 9. Provides mobile app (iOS/Android) to arm/disarm, check sensor status, view history, turn on/off smart plugs - again only if you locate someone else code online, or write your own, install it with the web portal and hope it works. From what i read there were still some bugs. 11. What kind of notifications provided when the alarm is triggered: mobile app notification, SMS, phone call, email, or multiple? - Don't know, couldn't get the "app" to actually work. 12. Specify that 2 or more motions sensors must be triggered before alarm goes off, to prevent single motion sensor false alarms - you would probably need to write code. 15. Will IRIS sensors that work with SmartThings be supported on all the above features and can participate in the security setup with no special limitations? Okay this is the tricky part. Only V2 sensors will pair with the ST hub. If you get the ST & ADT, you can only use the ATD sensors and only use 5. of them. So yes, ST can do some of this. I removed the questions i didn't have answers to because i couldn't get the 3rd party apps, plug ins to work. In order to get ST to work like an alarm, you have to have a plug in or code. There are some you can pay money to subscribe to, there are some free ones. I have the v2 keypad. I installed the "plug in" for that and the SmartApp someone else had written and couldn't get it to work. in my mind, if i can't get it to work easily, then its going to have failure points and will not be dependable. as of right now. I have been tossing around moving to abode. Or keeping smarthings to do automation and get ring because i am already paying for that. I"m separating out automation and security. Wife needs stable security and I could experiment with automation as I wish. part was solidified when I saw it works with my 2 garage door openers, maybe my door lock and in the future hopefully my 2 thermostats. Ring alarm will do most of the things you are wanting to do. I plan to do Ring for Security, then Smart Things for home automation only. Ring alarm will do most of the things you are wanting to do. I plan to do Ring for Security, then Smart Things for home automa﻿tion only. I thought about this, but I really don't want to loose the ability to use motion and contact sensors for automation. The more I try to figure out which system to go with, the more I realize just how much combo work the contacts and motion sensor are doing for me. I feel like separating out the systems to avoid this type of monumental failure at my house, even if it means some doors having dual sensors. It is nice to be a part of this forum which offers a very diversified outlook and experience with various systems. 2. Adjustable countdown time for arming/disarming - the presence option has a delay setting by min. 3. Partial arming mode – ability to exclude any sensor from the Partial mode - yes you can configure contact and motions individually. 4. Ability to exclude a sensor from all arming modes (Full, Partial, etc), however get notified every time the sensor is opened/triggered - you can exclude it from security armed away and armed stay and then create a custom monitor that notifies you based many options. 5. If at any time the sensor disconnects or goes offline, the system will notify me. Also, how soon will I get the notification? Haven't tested this. 14. Pro monitoring option month-to-month with no contract - not without ADT I believe and I've not heard good things. 16. Does the SmartThings hub have low power consumption (under 5W)? - this is critical for proper battery backup. - just buy a ups. @dusterp - oh thank you so much for taking time to answer all the items – you have given me most complete help so far. Even a SmartThings rep on the other forum did not bother to answer each item. And grateful for the screenshots too! One thing I’d disagree with you though: keypads are very much in today IMHO, and that’s why it was #1 in my list. How many times I’d come home with my phone discharged and couldn’t use the app to disarm. And I hate carrying an extra fob with me. Also if I have a couple of relatives who could enter my house in an urgent situation, I don’t want to equip them all with fobs, and track their battery status, etc.…a PIN is all I want to carry around with me and give to others. So, by presence do you mean geolocation on the phone, or a fob presence? Which one does ST support out of the box? Agree on the keypad issue. Keypads are essential for me too. With multiple keypads throughout the house I can hear the chime for those doors that I have it set on for without having to have my phone on my person. I also think the ability to have a one-time code (and being able to set that up from the mobile app) to let someone you know in to drop something off would be nice. Even my GDO keypad allows me to set a one-time code (only locally of course), which has proven useful on occasion. [mention=44]dusterp[/mention] - oh thank you so much for taking time to answer all the items – you have given me most complete help so far. Even a SmartThings rep on the other forum did not bother to answer each item. And grateful for the screenshots too! Presence can be either, Geo phone location or fobs. ST has it's own fob but Iris are supposed to work to. I haven't tried them yet. You can always use your door lock unlocking to disarm and arm the house. You can also use a light switch that's out of the way. I'd recommend a hidden button only you and the person you want in to know about if the lock disarming it causes concern. If you use a button you could program it to arm on single tap and disarm on press and hold. I use the door unlock method because for me if they have a code then why not just make the door lock a keypad. Yes someone could break a glass window by the door and unlock it from the inside but I have a glass break sensor to cover that alert and window and motion sensors. ST does have 3rd party apps that make the Iris keypads work but I've not used them. It also has a 3rd party lock app that only allows the door lock's keypad to disarm vs the lock just unlocking to disarm. So with ST you can do anything you want but it requires a 3rd party app depending on what you want to do. I've tried to stick with stock apps. I just posted on how to solve for keypads with the door lock pad and mentioned pros and cons along with other alternatives including adding Iris keypads, see previous post. If you have Alexa or Sonos devices you make them say anything when anything happens so it's far superior to a beep on a keypad IMO. You actually know what's going on without having to check your phone to see why the keypad beeped. Like, "master sparc your front door is open" or "garage door open master sparc" or even could make it say "shut the damn door kids the AC is on" if the AC is on and the door is open for more than x minutes. Echo dots are cheaper than a keypad and multipurpose. You couldn't set a one time code in Iris. 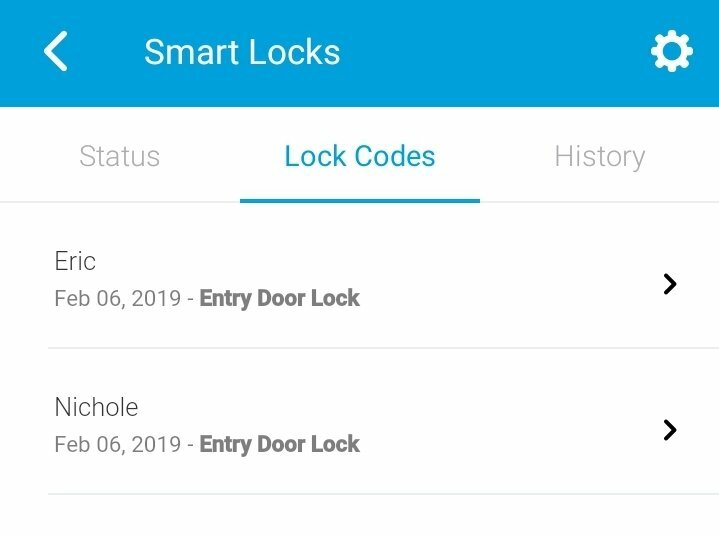 You can in Smartthings with the 3rd party smart Lock app. You also get lock code schedules back to for a housekeeper on Wednesdays from 9am to 3pm as an example. If you don't want to use 3rd party you can always go in the app from anywhere and create a code and once used you can go in and delete it very easily, burner code solved, and much easier than getting out your GDO manual to remember how to set a burner code on those devices in person. What hub do you guys recommend? V2 or V3? There is no difference in core capabilities between the two, however there are some nuances.. The v3 hub can connect on wired Ethernet or wireless and is capable of switching between the two automatically. The v2 hub is wired Ethernet only. The v3 hub is Zigbee 3.0 compatible out of the box. The v2 hub will be software upgrade able. None of this means anything now as the SmartThings app doesn’t support QR code pairing yet. The v2 hub has the option for battery backup (4 AA). The v3 hubs does not. The v2 hub has a faster processor and more memory than the v3 hub. This is only a benefit for local processing and probably not noticeable until you have a couple hundred devices. Those are all of the differences that I know of. My version 2 hub and version 2 keypad didn't always communicate leading to the alarm activating and having to enter the code more than once or use the phone app to disarm the alarm. Distance (35'), wood furniture (2 1" thick panels) and walls (2) were probably a factor. With the V3 hub and keypad combination it worked everytime. According to IRIS they both had better range and it made my system work every time. Just so I am clear, I am speaking in terms of SmartThings v2 vs v3 hubs.. Not Iris. I know nothing about the differences between the Iris hubs as I've never owned a v3 hub.